Religion and politics, those two topics that should never be discussed at Thanksgiving dinner, clash forcefully in ABC’s “Of Kings and Prophets,” a bloodstained take on the biblical tale of David and Saul that patterns itself more on HBO’s “Game of Thrones” than History’s recent “Bible” and “A.D.” miniseries. To that end, the first minutes of the show, which premieres Tuesday night, are all fire and brimstone, filled with swords slicing across throats and blood arcing through the air as King Saul (Ray Winstone) leads the Israelites in a fierce battle against their ancient rivals, the Philistines. It’s an arresting way to introduce any series, especially one working under the constraints of network television. Christian audiences enticed by the prospect of a show drawn from the Old Testament will determine very quickly whether such an explicit interpretation is something they can stomach. Yes, a fair share of characters do get stuck with the pointy end, to quote Arya Stark, especially by hulking man-mountain Goliath (Garth Collins), who represents the Philistines’ biggest symbolic threat to Saul. But all the bloodletting soon takes a backseat to slightly higher-minded (not to mention more censor-friendly) plot points, from requisite palace intrigue to a forbidden flirtation between future king David (Olly Rix) and Saul’s winsome daughter Michal (Maisie Richardson-Sellers). There’s a touch of “Dynasty” to the proceedings, and more than a pinch of “The Tudors” to the show’s characterization of David as a lusty lady-killer whose self-confidence seems to border on self-delusion, particularly once the prophet Samuel (Mohammad Bakri) discreetly anoints him God’s chosen one. It says something about a show’s intentions when a pivotal duel to the death gets shoehorned into one episode, yet the question of which of two gorgeous princesses will end up with the male lead is positioned as a major cliffhanger. The theatrical dialogue, which swings closer to Shakespeare’s era than Saul’s, further sells “Of Kings and Prophets” as an unusually big-budget soap opera. Winstone understands this and has a blast, playing his conflicted monarch with a mix of imperial bluster and gravel-voiced gravitas. Amid the women of Saul’s court, Simone Kessell is a standout, nailing both Queen Ahinoam’s regal mien and the mix of shame and dismay she feels over the king’s constant philandering. Rix, a less familiar face, is also promising. He boasts the features and physique to depict David with maximum smolder, but there’s surprising sincerity in the way he plays his hero’s brewing vacillation between the God he worships and the king he serves. This isn’t the first time David and Saul have anchored a network series — NBC’s short-lived saga “Kings” attempted to modernize the story back in 2009, with Goliath as an enemy tank and a grenade standing in for David’s fateful slingshot. 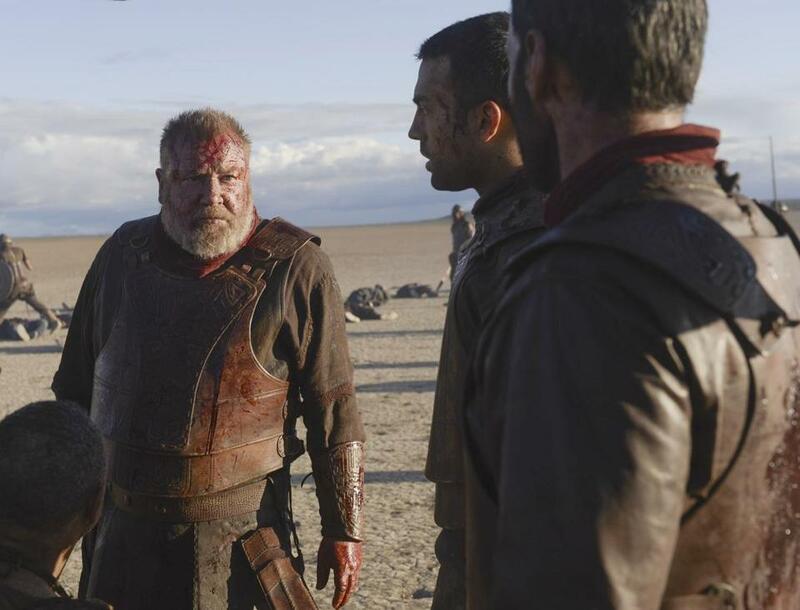 Like that series, “Of Kings and Prophets” boasts high production values, impressive choreography, and an array of thespians who know their way around a monologue. And yet, in spite of its dirt-smeared, sweat-stained execution, this new offering is a far more lightweight and literal concoction. “Kings,” in the few weeks it was on the air, had a big, bizarro vision: converting the Book of Samuel’s political upheaval into a grand metaphor for Bush-era America. It’s easy to wish “Of Kings and Prophets” aspired to such heights. Maybe it will last longer precisely because it doesn’t want to. The show is content to revel in sweaty theatrics and solid performances, and its source material provides enough narrative direction that the writers can likely get by just fine with an excess of gritty-reboot reinterpretation more than real imagination. What’s most sorely lacking in “Of Kings and Prophets,” though, is that same spark of narrative ingenuity. Without it, the show isn’t the biblical “Game of Thrones” it wants to be. Instead, it’s more like a descendant of “Spartacus: Blood and Sand,” made just modest and melodramatic enough to irk both faith-based audiences and those coming to it in search of a salacious, sanguinary fix. On ABC, Tuesday at 10 p.m.